The M18 FUEL < inch Impact Driver is the Fastest, Most Compact, and Most Powerful tool in its class. The POWERSTATE Brushless motor delivers up to 2,000in-lbs of torque and up to 30% Faster Driving speed, increasing users productivity for the most demanding fasteners on the job. With the Most Compact tool at only 4.59 inch in length, users will have more access in tight spaces. The REDLINK PLUS intelligence ensures maximum performance and protects from overloads, heating or over-discharge. The REDLITHIUM Battery Pack delivers more work per charger and more work over the life of the pack than competitors. The 4-Mode DRIVE CONTROL provides greater control over output speed and power for greater versatility. Self-Tapping Screw mode provides faster installation time by reducing stripping of fasteners. The DeWalt 20V MAX Lithium-Ion Impact Driver has a compact (5.55 inches from front to back), lightweight (2.8 lbs.) design that fits into tight areas with total ease. It offers three LED lights with a 20 second delay after the trigger is released, that provides visibility without shadows. This driver also features a one-handed loading 1/4-inch hex chuck that accepts 1-inch bit tips, and it produces up to 3200 impacts per minute. Powerful, durable DC motor with protection against overheating and overloading. 2-speed solid metal gearbox for universal screw driving work. Short and lightweight due to 1/4 inch tool mount and absence of drill chuck and mechanical torque setting. 350 screw connections (5x40 mm) with one battery charge (2.5Ah). 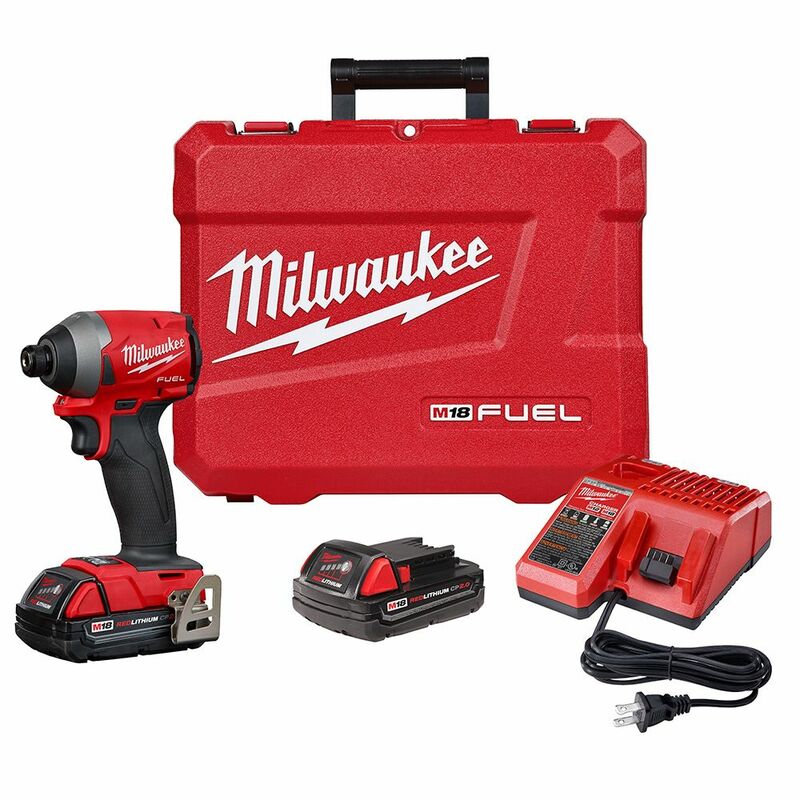 M18 FUEL 18-Volt Lithium-Ion Brushless Cordless 1/4 inch Hex Impact Driver Kit W/(2) 2.0Ah Batteries The M18 FUEL < inch Impact Driver is the Fastest, Most Compact, and Most Powerful tool in its class. The POWERSTATE Brushless motor delivers up to 2,000in-lbs of torque and up to 30% Faster Driving speed, increasing users productivity for the most demanding fasteners on the job. With the Most Compact tool at only 4.59 inch in length, users will have more access in tight spaces. The REDLINK PLUS intelligence ensures maximum performance and protects from overloads, heating or over-discharge. The REDLITHIUM Battery Pack delivers more work per charger and more work over the life of the pack than competitors. The 4-Mode DRIVE CONTROL provides greater control over output speed and power for greater versatility. Self-Tapping Screw mode provides faster installation time by reducing stripping of fasteners. M18 FUEL 18-Volt Lithium-Ion Brushless Cordless 1/4 inch Hex Impact Driver Kit W/(2) 2.0Ah Batteries is rated 4.9 out of 5 by 25. Rated 5 out of 5 by Jth from Excellent impact driver. Starting to switch to Milwaukee after ryobi... Excellent impact driver. Starting to switch to Milwaukee after ryobi set is starting to die off. Great for inbetween studs and other tight spaces. LED light is bright as well. Doesn’t chew through the small 2amp batteries with this kit however if you don’t have any invest in a 5amp battery. Rated 5 out of 5 by Adam from For a 1/4 impact, it has lots of torque. I can fit it in spots my M12 couldn't go. Overall well ... For a 1/4 impact, it has lots of torque. I can fit it in spots my M12 couldn't go. Overall well built. Rated 5 out of 5 by HomeDepotCustomer from It’s awesome! Plenty of torque and battery power!... It’s awesome! Plenty of torque and battery power! Rated 5 out of 5 by Connor from The gun is 110% worth the money, tons of power.... The gun is 110% worth the money, tons of power. Rated 5 out of 5 by Ray from This is a great tool. Batteries last a long time... This is a great tool. Batteries last a long time and torque is excellent.